Headlines suggesting (and in some cases outright declaring) that smokers will be given e-cigarettes free on the NHS have emerged in the UK today. But is that the main point made by the report on which it’s based? PHE looks forward to the arrival on the market of a choice of medicinally regulated products that can be made available to smokers by the NHS on prescription. This will provide assurance on the safety, quality and effectiveness to consumers who want to use these products as quitting aids. This relates to the provision in the Tobacco Products Directive that if an e-cigarette company wishes to market their product as a smoking cessation device, it must first get its product medicinally licensed (in the UK, by the MHRA). If the company does not wish to apply for and obtain a medicinal license, then the Tobacco Products Directive applies. On the surface at least it appears this might be another case of a media headline frenzy that bears not very much relation to the actual report content. But the report should be seen as a positive endorsement of vaping products, not least because it presents and summarizes evidence in a balanced manner, but it also lays out very clearly that vaping is already, and should be more so in the future, a positive thing for public health. Overall, the adult and youth data suggest that, despite some experimentation with EC among never smokers, EC are attracting few people who have never smoked into regular use. 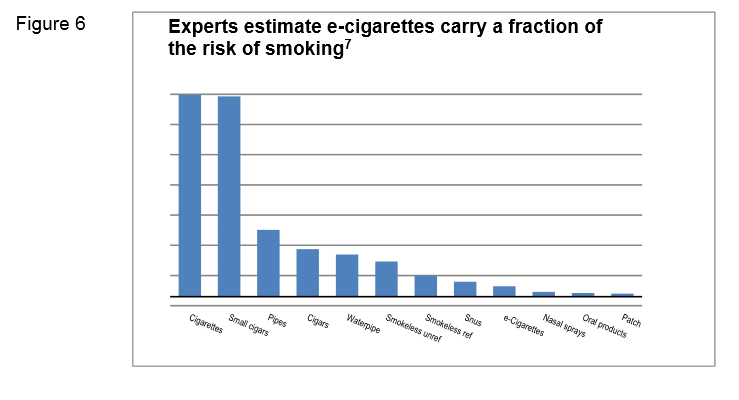 …the vast majority of youth who regularly use EC are smokers. Regular EC use in youth is rare. These findings, to date, suggest that the advent of EC is not undermining, and may even be contributing to, the long-term decline in cigarette smoking. The emphasis above is ours, simply because it is a statement that warrants repeating. 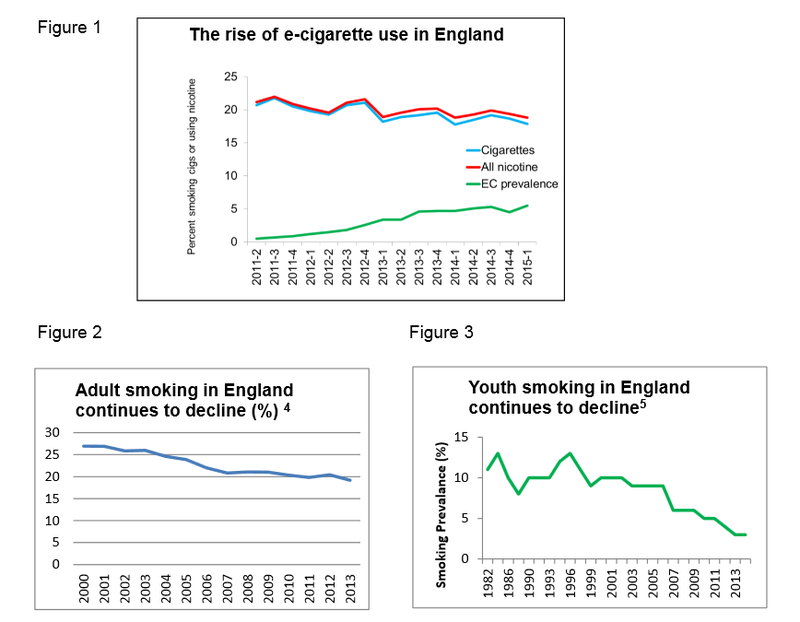 If the numbers of vapers increases at the same time as the numbers of smokers is declining, then can e-cigarettes really continue to be seen as undermining a decline in smoking? older textbooks. Eventually, the assertion was found to be based on dubious self-experiments conducted in the 1890s. With the increase in EC use, there has been an increase in calls to poison centres following accidental exposures but these remain lower than calls following such exposure from tobacco and none resulted in any serious harm Serious nicotine poisoning seems normally prevented by the fact that relatively low doses of nicotine cause nausea and vomiting, which stops users from further intake. E-liquid normally comes in 10ml bottles containing up to 360mg of nicotine. This poses no risk to vapers if used as intended. The liquid however should be in ‘childproof’ packaging to prevent small children, who may find the flavouring appealing,from drinking it. This seems to have been widely accepted by the EC industry. All e-liquids we have seen so far in the UK and globally were sold in child-resistant packaging. This (10ml, 36mg nicotine strength) poses no risk of nicotine poisoning if used as intended. An overenthusiastic vaper, like someone who is over-smoking, receives a reliable warning via nausea. If the 10ml bottle of e-liquid was drunk, it would cause nausea and vomiting but would be unlikely to inflict serious harm. Regulatory interventions should ensure optimal product safety but make sure EC are not regulated more strictly than cigarettes and can continue to evolve and improve their competitiveness against cigarettes. The revised TPD will introduce new regulations for EC or refill containers which are not licensed by the MHRA. The cap on nicotine concentrations introduced by the TPD will take high nicotine EC and refill liquids off the market, potentially affecting heavier smokers seeking higher nicotine delivery products. The fact that no licensed EC are yet on the market suggests that the licensing route to market is not commercially attractive. The absence of non-tobacco industry products going through the MHRA licensing process suggests that the process is inadvertently favouring larger manufacturers including the tobacco industry, which is likely to inhibit innovation in the prescription market. This means that small manufacturers, particularly non-tobacco industry manufacturers, who may be producing a greater variety or more satisfying EC, will not compete with larger corporations such as the tobacco industry in the prescriptions market. There are several consequences of this which should be explored. These could include an inhibition of innovation and damage public health. Alternatively, given the demand for prescribed EC products is as yet unknown, particularly in the population groups where smoking prevalence is elevated, the medicinal route may not impact public health. The appeal of EC may rest in the fact that they are not medicines. A review of the MHRA licensing process for EC, and its likely impact, is recommended. While Ireland’s plan to have reach ”endgame on tobacco” by reaching a smoking level of less than 5% by 2025, no where currently in that plan is there any mention of what role vaping products may have in helping to achieve it. PHE’s ambition is to secure a tobacco-free generation by 2025. Based on the evidence, we believe e-cigarettes have the potential to make a significant contribution to the endgame for tobacco. With opportunity comes risk, and a successful approach will be one that retains vigilance and manages these risks, while enabling a flourishing and innovative market with a range of safe and effective products that smokers want to use to help them quit. Smoking is increasingly concentrated in disadvantaged groups who tend to be more dependent. EC potentially offer a wide reach, low-cost intervention to reduce smoking and improve health in disadvantaged groups. Some health trusts and prisons have banned the use of EC which may disproportionately affect more disadvantaged smokers. …The rationale for such prohibition is unclear. 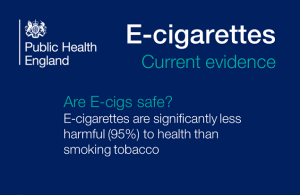 …there is an opportunity for e-cigarettes to help tackle the high smoking rates among people with mental health problems, particularly in the context of creating smoke free mental health units. 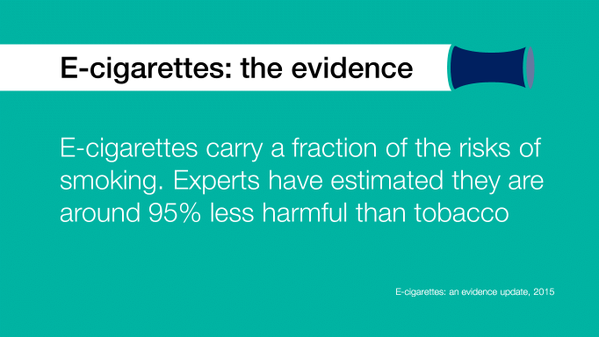 EC should not routinely be treated in the same way as smoking. It is not appropriate to prohibit EC use in health trusts and prisons as part of smoke free policies unless there is a strong rationale to do so. What effect if any might this report have on Ireland’s draft consultation of the Tobacco Products Directive implementation? Have Irish smokers been dissuaded from trying e-cigarettes by the sometimes vague (and sometimes explicit) negative messages about vaping products from both those in political and public health circles here? And once the Irish Department of Health has reviewed the current evidence, what might we expect to see published by them, the National Tobacco Control Office, or Healthy Ireland so that the Irish public can start to see a wider, more open discussion on tobacco harm reduction and vaping products?